← Storefronts Seattle covered on Artzone with Nancy Guppy! Artist Dan Reeder’s storefront at 312 Occidental houses a variety of vibrantly colored dragons, bringing a mystical playfulness to Occidental Park in the Pioneer Square neighborhood. 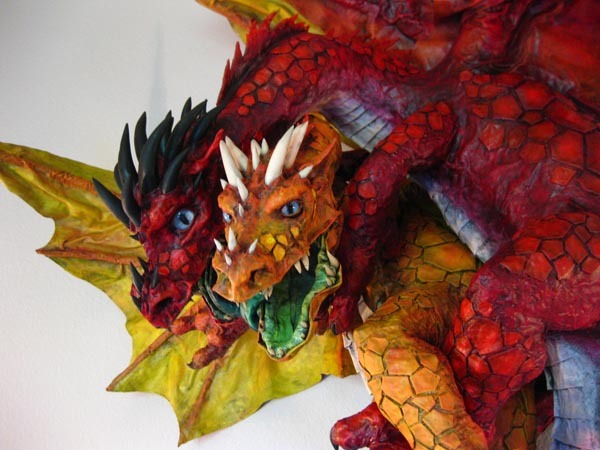 Also known as The Monster Man, Dan has been working with papier mache for over 35 years, and sharing his expertise with kids and adults since 1972. He is a 6th grade math teacher, has published three how-to-books, and frequently makes videos like the one below. His books and additional videos can be found on his website. The best part has been sitting at Cafe Umbria at 320 Occidental and seeing the reactions of people who walk past the storefront, without anyone knowing I’m watching. I’ve never been able to do that before. I see kids squealing as soon as they see the dragons. I’ve seen adults skipping, even running, after seeing the storefront from across the courtyard. Everyone takes photos, and not just of one piece. They methodically take a photo of each individual dragon on display. There are people smiling and pointing – no one just walks by. To me, this is artistic success. You can see Dan’s dragons at 312 Occidental this Thursday as a part of your Art Walk, or anytime through November. He also has a commission at 5 Spot Café in Queen Anne if you want to see more of his latest Gourmet Paper Mache!